My neighbor gave me delicious Kamaage Shirasu (boiled whitebait). If the fish is frozen, you can defrost it in the fridge overnight. Or 2 hours out from the fridge. Or place it in a Ziploc Bag (make sure water doesn't come in) and place it under running water for 15 minutes. 1. 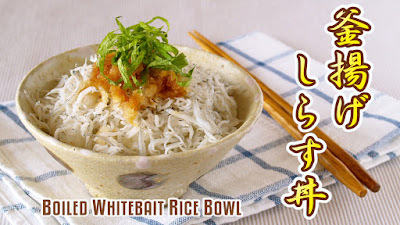 Defrost Kamaage Shirasu (boiled whitebait) as needed. 2. Top a bowl of rice with plenty of Shirasu. 3. Garnish with grated Daikon radish (grate the top part of Daikon because it is sweeter) and a few drops of soy sauce: this is called "Someoroshi" because the radish is dyed with soy sauce. Then place sliced Shiso leaves to finish.